Bally’s Entertainment broke ground on the Paris Hotel & Casino in April 1997. Costing $785 million and set on 24 acres of land, Paris took 2 and half years to build and opened on September 1st 1999. The property was designed by Bergman Walls Associates and the façade is based on a mix of the Paris Opera House and the Louvre. The hotel features a near half scale, (541ft) replica of the Eiffel Tower, a two thirds replica of the Arc de Triomphe and the infamous faded marquee is based on the Montgolfier balloon. Paris did feature a beautiful replica of the Fountaine des Mers, but has recently been removed to make way for the recent additions. After a severe downturn in patronage, due to the Global Finacial Crisis, Caesars Entertainment began a series of renovations to the property, beginning with a scaling down of the overall Parisian theme. In early 2011 the Chateau nightclub and Sugar Factory restaurant opened on the Strip front side and the target market is being re aimed at a younger demographic. 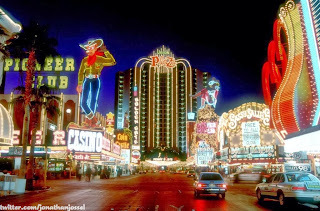 This week’s winner is @jonathanjossel for his picture of Fremont St, pre-Fremont St Experience. I LOVE old school color pictures of Fremont St without the canopy. The contrast between the neon lights and the black sky is breathtaking. This picture is taken from the middle of the road looking west and has to be at least 20 years old because the Union Plaza is anchoring the picture dead ahead. The Plaza stopped using the “union” name in 1992. The photographer was next to the Horseshoe and Golden nugget, just before the 1st st/Fremont intersection. 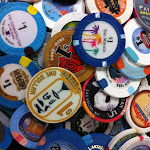 You can still see that Binion’s is still the Horseshoe (the name changed to Binion’s in 2005), Mermaids is still Sassy Sally’s (that changed in 2001) and La Bayou’s is still the Coin Castle (which changed in 1996.) You can’t see much of it but the Golden Nugget already has had it’s exterior remodeled to the style we are used to today. Lastly, the Fremont St Experience wasn’t built until 1994.